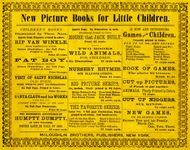 The McLoughlin brothers are considered the foremost American children's book and game makers of the late 19th century. The colorful chromolithographic artwork used for box covers, game boards, and cards were illustrated by a largely anonymous group of artists employed by the company. McLoughlin Brothers, Inc., produced lavishly illustrated children's books, board games, blocks and puzzles, and a plethora of card games. The majority of the illustrations for these novelties originated from previously published books by the company, including general portrayals of children, animals and holiday celebrations. Many of the images used for the playing cards in The Merry Christmas Games were originally used in McLoughlin Brothers ABC and Animal books. McLoughlin Bros. was a publishing firm that began in 1828 and was active until 1920, at which point it was sold to Milton Bradley. Some of the most collected and valuable American game boards were produced by the McLoughlins. Altough most games are just marked "New York" or "NY", here is a list of dates correlated to addresses. The list is more useful for books. Mcloughlin did put an address on games here and there.